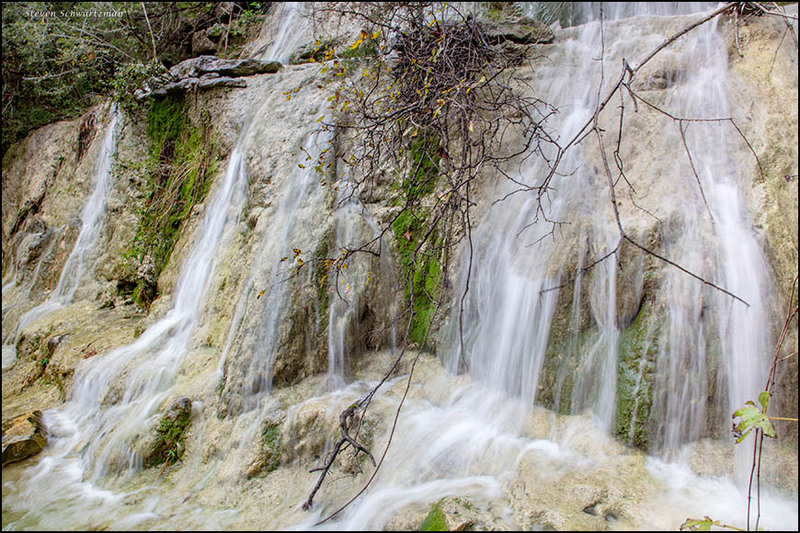 On October 22nd, right by where Bull Creek crosses under Old Spicewood Springs Rd. at flood gauge #6, I experimented with pictures of the patterns the current was making as it flowed over rocks. Below are two adjacent frames of the same place showing you what a difference 61/375 of a second makes. That unfamiliar fraction—yes, I’ve taken the liberty of assuming you’ve never seen it before—is the difference between the 1/6 of a second at which I made the first version and the 1/250 of a second at which I made the other one. If you have a preference, here’s your chance to speak up and say why you favor the version you do. A winning combination is the smooth reflectivity of the first shot upper portion with the smoothed turbulence of the second shot lower portion. Thanks for giving your impressions. Strangely, my senses see it the other way, with big-soap-bubble-like reflectivity in the upper part of the second picture and smoothed turbulence in the lower part of the first picture. Your mention of a combination makes me realize that the favored parts of the two photographs could be combined into a single image. I like the slower shots, and also like “rain-emboldened water” a lot! “Rain-emboldened” was a me-emboldened phrase that came late in the editing of the post. I’m glad you like it. Many nature photographers go for long exposures to produce silky waterfalls. I understand the appeal, but because that approach has become so common, contrarian me uses it sparingly. Then I’ll take credit for both and say thanks. Quite apart from the attractiveness of the photos, this is a nice tutorial on shutter speed. I was messing around on Sunday with blowing grasses, and I found that stopping the action was easier than capturing the grasses ‘flow’ across the prairie background. I think this will help the next time I give it a try. Do you set the ISO manually, or use the automatic setting? I tend to end up underexposed more than overexposed, and it seems that the ISO setting’s often the culprit — especially when I’m setting both the aperture and shutter speed. I’ve never used auto ISO, but I was thinking it might be worthwhile. You probably know my taste in water well enough by now to know that I’d prefer the second and third photos. I like the feathery texture in the first, and the composition of the fourth, with the green plants dividing the water, is attractive. But I like water that sparkles or shines, and the second and third show those qualities wonderfully well. I don’t use the auto-ISO feature, either. Normally I set the ISO first and the shutter speed next, letting the camera decide on an aperture. Then if I’m not happy with the aperture, usually because it doesn’t give enough depth of field, I adjust one or both of the other settings. In the first pair in this post, I like the second version because it preserves the soap-bubble-like sheen of the water as it flows over the rocks. That’s what caught my attention and got me taking pictures of that part of the creek. I may yet play around with combining parts of the first two pictures to see if I like the result. That’s a perfect description: “soap-bubble-like sheen.” I sometimes think of it as glassy: but glass-like in the sense of the clearest crystal, or even Chihuly. Comparisons to that glass artist might work, though Chihuly can be unruly. I like long exposures and I think you’re right that perhaps they’ve been overdone in the photography world. However, I almost always enjoy the smooth, silky water effect created from streams and waterfalls (your image #1) with the use of long exposure. I think it’s undeniable that many people, maybe even most people, like the silky effect, which is why photographers so often resort to long exposures of waterfalls. 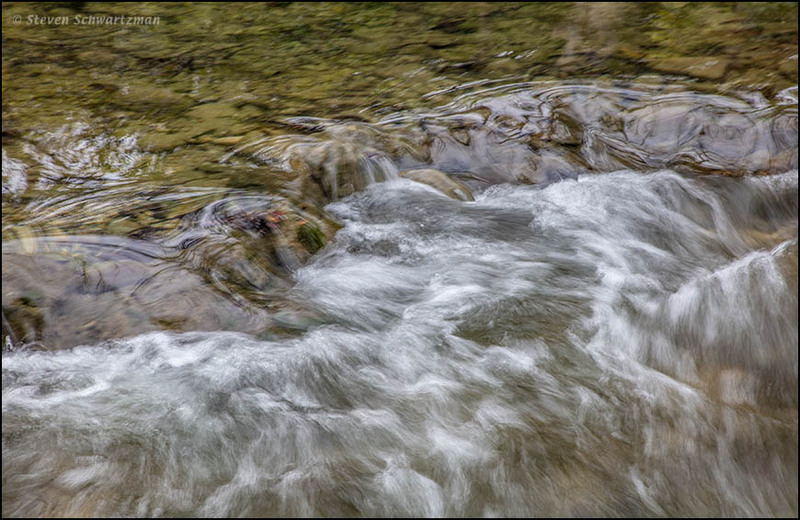 I’ve experimented with flowing water and found that I can succeed with a short exposure or a long exposure but usually not an exposure in between. I once read that with shooting these long exposure water effects that it was best to do it on a cloudy day, otherwise an ND filter was needed (because of the sun). I also read that when including trees and leaves with the water, one had to do multiple exposures because the slow shutter speed could blur them. I use to be interested in doing it, but streams and waterfalls were usually found in isolated areas, so getting to them required extensive planning and carrying the right equipment and using the filters if needed. I suppose that in this scenario it’s also important (or at least practical) to use a weather-sealed camera and lens because moisture is more likely to penetrate the lens. I may have attempted it in the past. Thanks for posting these. Yes, for very long exposures, say several seconds, the scene will often be too bright unless you use an ND filter to reduce the light. And yes again, the breeze is a problem with long exposures because moving plants will blur during a long exposure. Beautiful! I opened the link and the image is wonderful. That is how I like them, and I see how you take advantage of the heavy rains to make them more dramatic. With so much water pouring over the falls, it was a great opportunity. I wore thigh-high rubber boots and worked my way down to the base of the falls and took plenty of pictures. I like the faster shutter speed in the first scene and the slower in the second. That’s the way to go: a split decision. 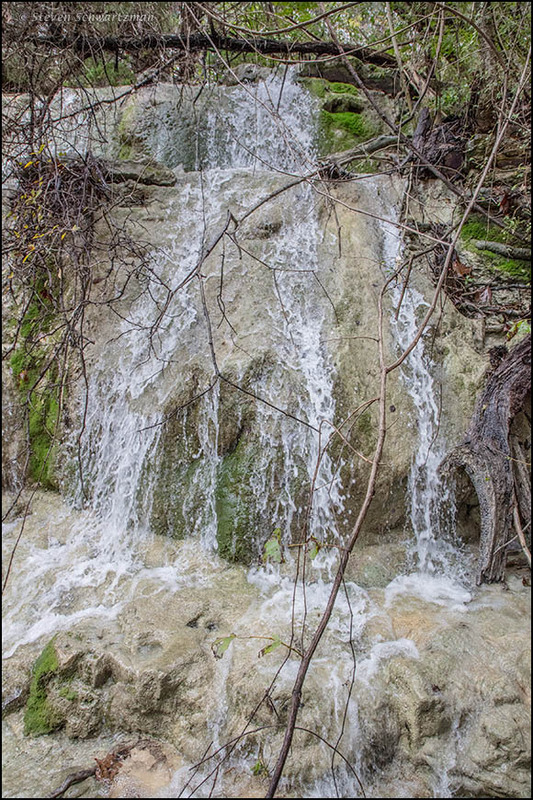 I assume you like the faster shutter speed in the first scene because it preserves the surface film of the water flowing over the rocks (which is why I like it). In the second scene, there was no such surface film to be preserved, so silky water, here we come. If I’ve misrepresented your analysis, please let me know. I like the second shot a lot better. I prefer water to look like water and not all furry the way so many photographers seem to do these days. 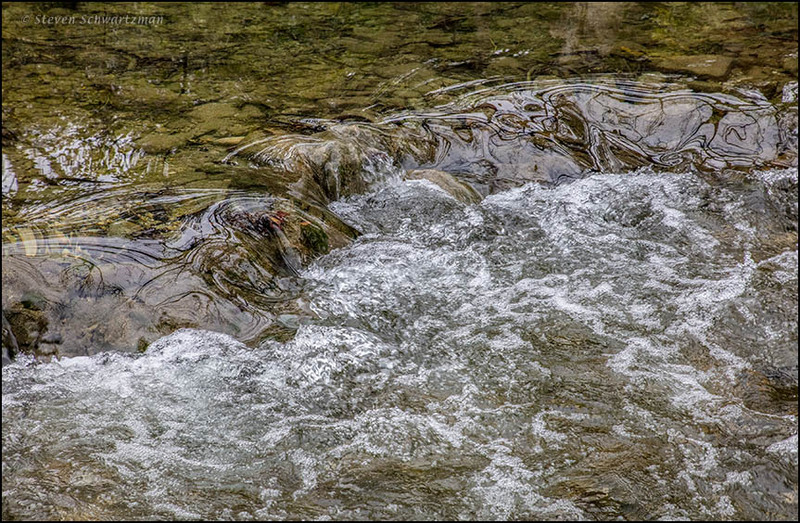 This is a nice little stream. Does it flow only after rain? In general I’m with you in wanting water to look like water and not fur. Once in a while I experiment with long exposures and occasionally get a picture I like, even if it’s not realistic, but mostly I go with high shutter speeds like the one I used for the second image. I’m glad you have a nice Creek. It is beautiful. It’s a five-minute walk upstream from the place shown in this post. Wow! That is really stunning. Yes, those scalloped cliffs are special. This is one of the few places in Austin I can offer up as truly scenic.